Alabama made the biggest statement in the SEC last Saturday with a convincing 38-10 victory against Georgia as a rare one-point road underdog. That victory vaulted the Crimson Tide back into the top ten of both major polls, while the Bulldogs plummeted in the rankings all the way to No. 19 in the AP’s latest Top 25. This week, No. 8 Alabama will play host to Arkansas as a 17-point home favorite with the total for this game set at 49.5 on BetOnline’s current college football betting odds. The Tide is 5-2 against the spread in the last seven meetings and they bring a straight-up five-game winning streak against the Razorbacks into Saturday night’s game. Georgia will try and bounce back as a three-point road favorite against Tennessee. The total for this game has been set at 55.5. The Bulldogs are 4-2 ATS in their last six road games and they come into this matchup with a SU 5-2 record in their last seven road games against the Volunteers. The total has gone OVER in five of the last six meetings. LSU is off to a perfect 4-0 SU start, but it is just 1-3 ATS. The No. 7 Tigers will go on the road this Saturday as 13.5-point favorites against 2-3 South Carolina with all three of the Gamecocks’ losses coming in conference play. The total for this game has been set at 49. The Tigers will put a SU five-game winning streak against South Carolina on the line this Saturday afternoon in Columbia. Another SEC team that made some noise last week was the Florida Gators. They have very quietly moved up to No. 11 in the latest AP poll following an impressive 38-10 victory against Ole Miss as seven-point home underdogs. They are now 5-0 SU with a profitable 4-1 record ATS. This Saturday the Gators will go on the road to face Missouri as 5.5-point favorites with the total for the game set at 39.5. This will be the fourth meeting since the Tigers joined the SEC and they have a 2-1 SU edge over Florida in this series. Last week I took the bait on Kentucky as a heavy 27.5-point home favorite against Eastern Kentucky as my pick of the week and the Wildcats needed a huge comeback just to force overtime in an eventual 34-27 win. That loss drops me to 2-3 on the year with my weekly SEC picks for FootballBetting.com, but I am confident that this week’s top pick will even things back up. 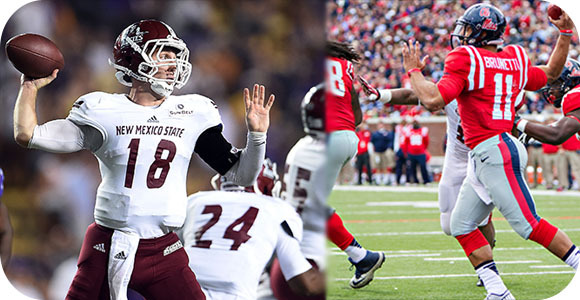 I have turned my attention to Saturday’s New Mexico State verse Mississippi game in Oxford. The Rebels have been listed as prohibitive 42-point home favorites with the total line set at 70. The Sun Belt’s Aggies find themselves in a very difficult situation following a rough 0-4 SU start (1-3 ATS). They have allowed an average of 45.8 points a game in those four losses while putting-up an average of 30 points a game on offense. They have been able to move the ball up and down the field with a very balanced attack, but when it comes to playing defense it appears that they simply let opposing teams score in order to get the ball back. The Rebels are going to be in no mood to play nice in this one following last week’s meltdown against the Gators. This is another potent offensive attack that can both pass and run the ball extremely well. Ole Miss is ranked eighth in the nation in scoring with 46 points a game and defensively it is giving-up an average of 23 points a game. The total has gone OVER in New Mexico State’s last five games and it has also gone OVER in 14 of its last 15 games on the road. The total has gone OVER in three of the Rebels first five games this season and it has gone OVER in four of their last six home games. It is no wonder that the total line has been set so high for this game, but I still see these two teams combining for more than 70 points this Saturday afternoon to take this game OVER.